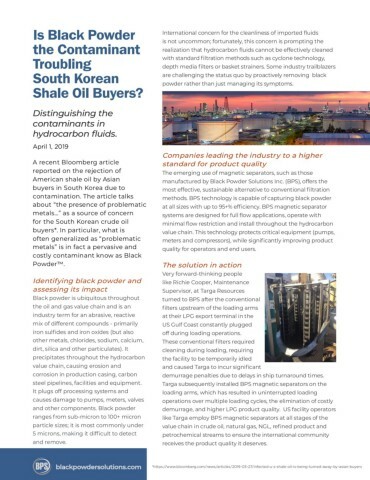 A recent Bloomberg article reported on the rejection of American shale oil by Asian buyers in South Korea due to contamination. The article talks about “the presence of problematic metals…” as a source of concern for the South Korean crude oil buyers*. In particular, what is often generalized as “problematic metals” is in fact a pervasive and costly contaminant know as Black Powder™. Black powder is ubiquitous throughout the oil and gas value chain and is an industry term for an abrasive, reactive mix of different compounds - primarily iron sulfides and iron oxides (but also other metals, chlorides, sodium, calcium, dirt, silica and other particulates). It precipitates throughout the hydrocarbon value chain, causing erosion and corrosion in production casing, carbon steel pipelines, facilities and equipment. It plugs off processing systems and causes damage to pumps, meters, valves and other components. Black powder ranges from sub-micron to 100+ micron particle sizes; it is most commonly under 5 microns, making it difficult to detect and remove. International concern for the cleanliness of imported fluids is not uncommon; fortunately, this concern is prompting the realization that hydrocarbon fluids cannot be effectively cleaned with standard filtration methods such as cyclone technology, depth media filters or basket strainers. Some industry trailblazers are challenging the status quo by proactively removing black powder rather than just managing its symptoms. The emerging use of magnetic separators, such as those manufactured by Black Powder Solutions Inc. (BPS), offers the most effective, sustainable alternative to conventional filtration methods. BPS technology is capable of capturing black powder at all sizes with up to 95+% efficiency. BPS magnetic separator systems are designed for full flow applications, operate with minimal flow restriction and install throughout the hydrocarbon value chain. This technology protects critical equipment (pumps, meters and compressors), while significantly improving product quality for operators and end users. Very forward-thinking people like Richie Cooper, Maintenance Supervisor, at Targa Resources turned to BPS after the conventional filters upstream of the loading arms at their LPG export terminal in the US Gulf Coast constantly plugged off during loading operations. These conventional filters required cleaning during loading, requiring the facility to be temporarily idled and caused Targa to incur significant demurrage penalties due to delays in ship turnaround times. Targa subsequently installed BPS magnetic separators on the loading arms, which has resulted in uninterrupted loading operations over multiple loading cycles, the elimination of costly demurrage, and higher LPG product quality. US facility operators like Targa employ BPS magnetic separators at all stages of the value chain in crude oil, natural gas, NGL, refined product and petrochemical streams to ensure the international community receives the product quality it deserves.